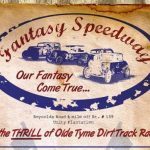 Fantasy Speedway – " The way life should be. " 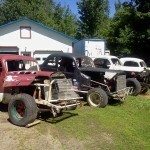 – A Time Warp of True Maine Vintage Racing History! 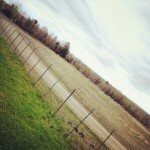 A Time Warp of Maine Racing History ! & You can find us on Facebook too! Lookin’ forward to seein’ y’all this season! THE WAY IT WAS, IN THE BEGINNING ! 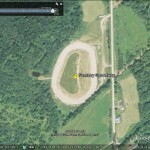 Fantasy Speedway Historical Racing Assn. is an all volunteer Maine registered non-profit historical preservation organization. We are committed to preserving the formative years of Maine’s stock car racing heritage, that exciting dirt track racing era of times past, and sharing it with all of our fans, friends, and supporters. Many of us dreamed of a day when flathead Fords, “stovebolt” Chevys, and in-line Mopars might once again join together and replay that beautiful old music on the primitive dirt tracks of yesteryear. Yet it ended 6+ decades ago; never more to be enjoyed or appreciated for what it was, nor remembered for its contribution to automobile racing history here in the State of Maine and across the country. Automobile production ceased following the attack on Pearl Harbor, resulting in only a few 1942 models making it to showrooms. Leftover 1941 models and the limited production 1942 models quickly became military staff cars, as car manufacturers converted to wartime production. America’s young men and women committed themselves to achieving victory and freedom for all of us; and times were tough, especially for those risking it all. With no new cars, nor parts to repair the old ones, wartime workers and their families coaxed, enticed, persuaded, wheedled, and patched the car they had already worn out, in order to make it through the war years. 1946 brought better times for families as military personnel began returning home, and automobile production began anew, primarily with warmed over 1942 model automobiles. 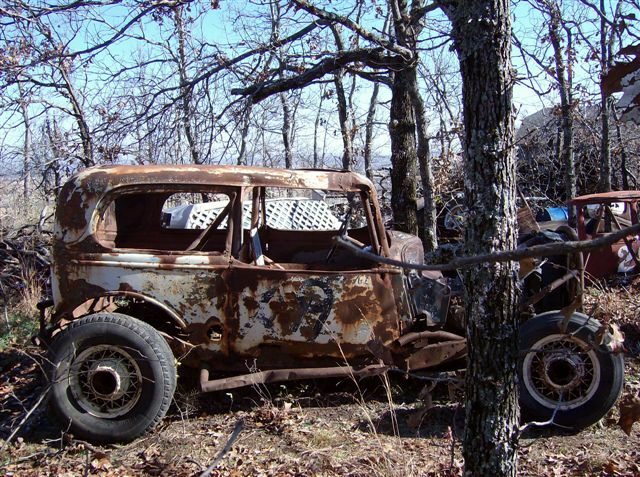 The 1930’s thru 1941 model year cars that had managed to get people through the war years disappeared down behind the barn or out back into the woods, or sometimes to the local automobile graveyard. And there they sat. In 1949, auto manufacturers presented America with newly designed cars like nothing that had been seen before. These cars were a major departure from the cars of old, both in styling and engineering, and America was once again on the road ! Our wartime heros were still in the process of extricating themselves from the horrors and pressures of military action, and were game for most anything that could push those unpleasant memories aside, or provide them with an adrenaline “rush”. Southern boys had already converted some of their old “moonshine” cars for organized competition in a neighbor’s back field, or at an old fairgrounds dirt horse track. 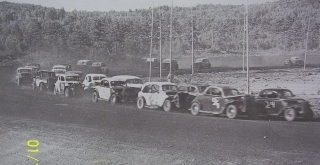 Maine was not far behind, as this new sport called “Stock Car Racing” began in earnest during 1949; and Maine’s young men and women were ready. By the early 50’s, Maine may have had as many as 15 dirt tracks operating on a weekly basis. 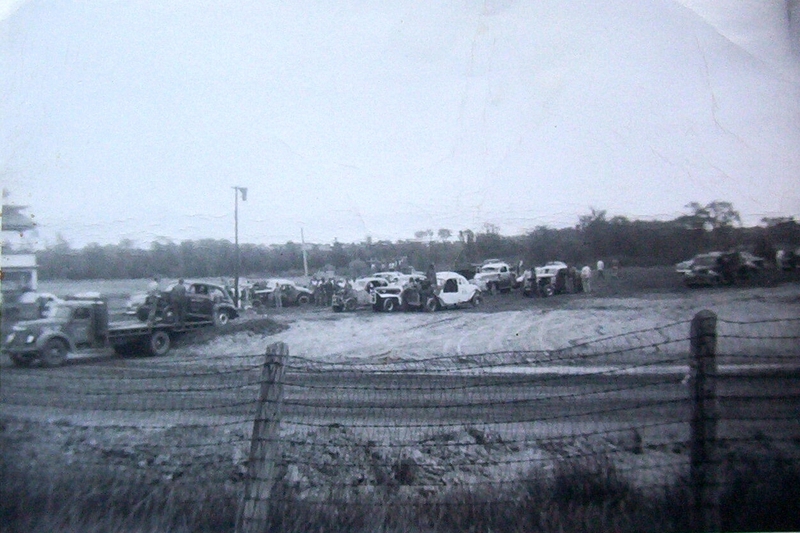 Those once discarded automobiles again found a place within the family structure, as they were pulled out of the Maine woods, fired up, and converted to racing automobiles in only a day or two. Maine’s dirt ovals soon flourished as old family sedans, farmer’s pickup trucks, and an occasional doctor’s or salesman’s coupe hit the dirt running. And Mainer’s were rocking ! The 1950’s was the day of the “Jalopy” style racer – the era that began it all – for THESE were the original STOCK CARS. 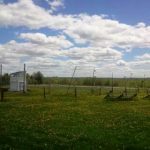 1936 Chevrolets, ’38 Plymouths, ’40 Fords and an occasional Cord, Terraplane, Essex, Rockne, or Lafayette broadsided their way around Maine’s many dirt ovals. 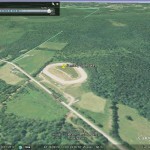 As stock car racing in Maine “progressed” over the years toward more modern, more sophisticated, and more expensive racing machinery; racing ovals correspondingly evolved toward more professional appearing facilities. 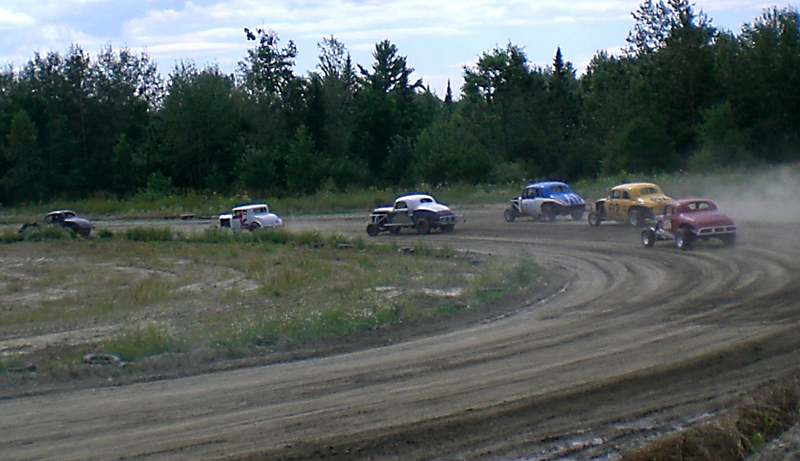 The efficiencies of asphalt (from a promoters standpoint) eventually brought about the demise of dirt based stock car racing activities here in Maine, although Beach Ridge did manage to hold out until the mid-80’s. In the process of these changes, the special aspects surrounding stock car “dirt tracking” got lost and nearly forgotten here in Maine. Many other states, however, never did lose the attraction and enthusiasm for racing on the dirt, and maintain their dirt heritage to this day. 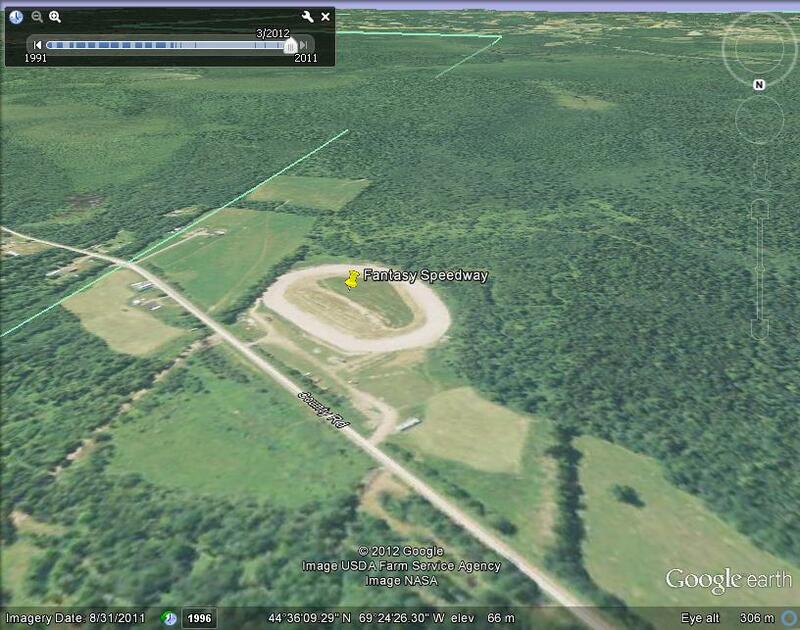 It is reported that dirt tracks still outnumber paved racing facilities in the US. 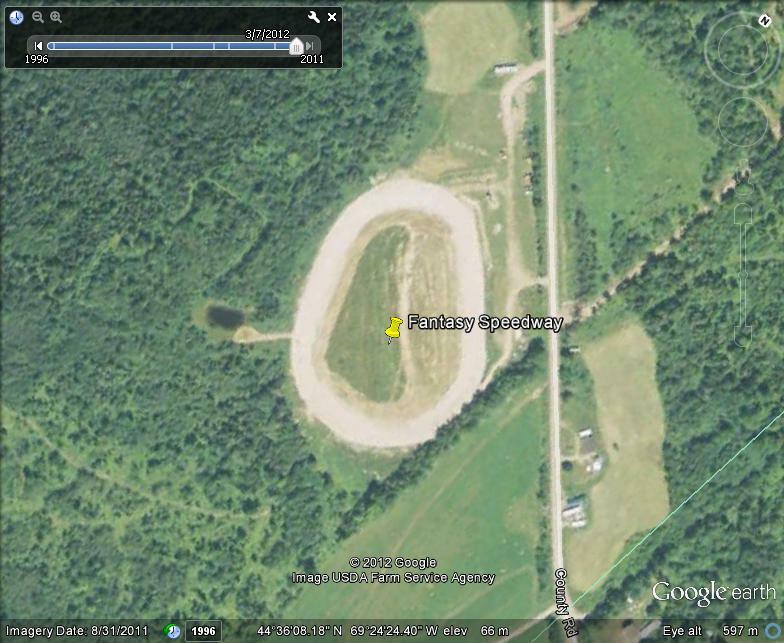 Maine will soon be seeing something of a “dirt tracking” revival of it’s own, with Unity Raceway having ripped up the aged asphalt and now in the process of converting to a dirt racing surface for the 2019 season, complimenting our own 3/8 mile period correct (as in “primitive”) vintage dirt facility in Unity Plantation, 3 miles down the road. Speed itself has been for sale for many decades, and can certainly be purchased today if one has sufficient finances to invest heavily in specialized race car components. Race cars now employ sophistication and engineering never dreamed of back in the day when it all began. Even some so-called “vintage race cars” make use of this more modern sophisticated chassis construction. 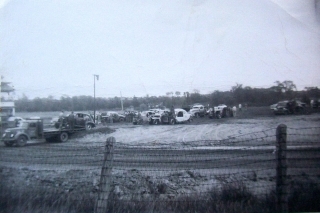 Today’s race cars often arrive piece-by-piece in brown or white trucks and are merely assembled on site. Money tends to be the prevalent construction method these days; the outgrowth of which can be conflict and animosity. But ours was a different time, when you began with an old car, did only what you had to do to get it going, used what you had or “fudged it” in some way that worked, and went racing! Terms like “tubular frame”, “jacking bolt”, “wedge”, “slicks”, “racing shock”, or “coilovers” did not yet exist. Fun with your friends, your brother, or your Dad was the motivation and who took home the so called purse was of far less importance. And helping the other guy was the way it was done. We hold the same philosophy today as the olde-timers did in the beginning, and continually strive to maintain this historically significant racing era as authentically and as honestly as we are able to do so, nearly 70 years later. Straight front axles, leaf springs, and stock frames remain prominent in our game plan, as do ignition systems energized by a single wire to a stock coil and fired by a set of points. “As simple as it gets” ! 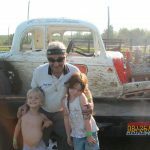 We are indeed most fortunate to enjoy the “cutest” race cars of all time, and to once again experience the sights, the sounds, the excitement, and the action of this almost forgotten stock car racing phenomenon. Bringing understanding, appreciation, and excitement to many generations in the future is the goal of our “living museum”. 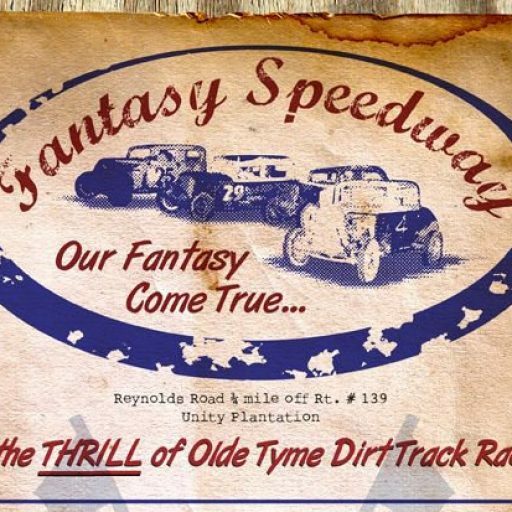 Our “living museum” of racing history is located on Reynolds Road in Unity Plantation, just “down the road a piece” from the Unity Raceway of olde (#139 north) toward Benton/Waterville. This facility is offered for our use on a no cost basis by Mr. Ed Picard; a gentleman, supporter, and fellow enthusiast of true early era stock car racing. Years of work by our vintage racing enthusiasts and volunteers have produced a racing facility reminiscent of the simpler and more primitive times in which our race cars lived and “played”, right down to our era correct track service vehicles. Our 1948 GMC and 1947 International water tank trucks help keep the dust under control. Our 1946 Ford wrecker/push truck helps get things moving and drags whimpering race cars back to the pit area so the crews can begin the mending process. Our “much more modern” 1966 Galion road grader helps keep the track surface “groomed” for racing. Our group of friends have been having fun since the summer of 2004. 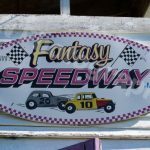 Fantasy Speedway appears to be the only race facility in the U.S.A. functioning both on a non-profit basis, and as a fully volunteer operation, “just for the love of it”. Our greatest rewards come in “turning right to go left”, sliding rather bravely through a turn, having fun with one’s family and friends, and sharing it all with each other ! There are neither purses nor trophies for the drivers. There is no reward for the first to cross the finish line beyond a checkered flag and a few moments of celebrity. 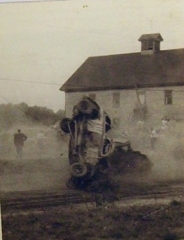 We each became a winner when that green flag flew once again over our antique race car, for that which we so enjoy today was never supposed to happen again. Our “Fantasy” has indeed come alive. We invite you to join with us in this unique experience and enjoy the excitement, the “music”, and the fun these olde race cars still generate today. We neither choreograph our racing events nor predetermine finishing positions, for our goal is to demonstrate all aspects of 50’s era stock car racing as accurately as possible. Anything but honest racing would be false. They did not “fake it” then, and we will not “fake it” now. 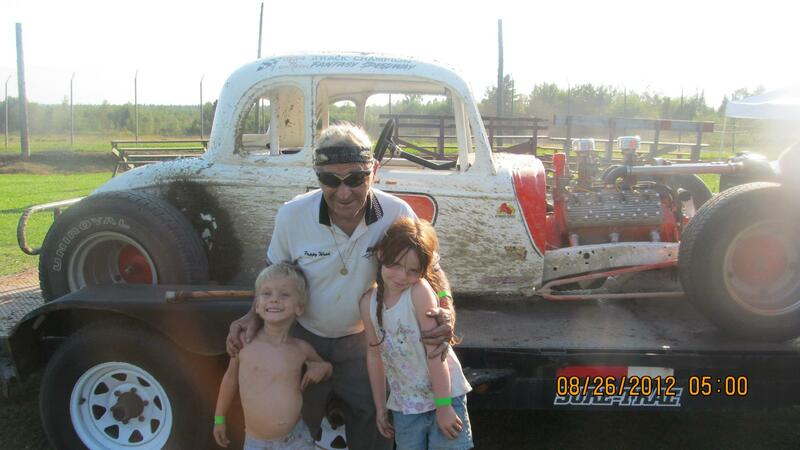 Nearly one half of our vintage race cars are original 50’s era stock cars, i.e. 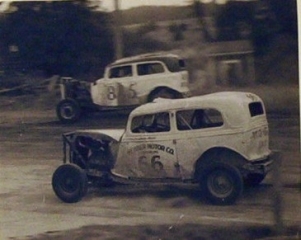 passenger cars manufactured from the late 1920’s through the late 1940’s and converted for racing in the 1950’s, which have been rescued after 50 or more years living in the Maine outdoors and restored as accurately as possible. The remainder of our race cars are newly built in the old fashioned way from authentic period correct antique autos (and/or parts thereof) that we continue to discover still growing in the Maine woods; those cars somehow having escaped the racing scene the first time around. Our antique race cars may not achieve the faster racing speeds of today’s high tech chassis and engines, but they are what they were, straight axles and all ! 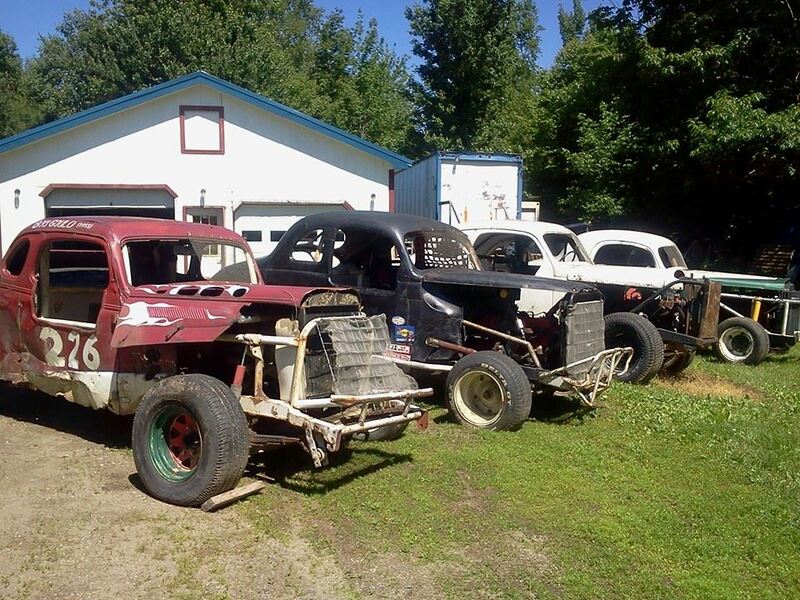 On the other hand, racing our antique race cars on genuine Maine dirt provides its own kind of excitement and fun that is unattainable in any other forum. Sliding through the turns of our dirt track can be accomplished (barely) by a 1937 Ford 85 hp. flathead V-8, or a 1948 General Motors in-line six sporting 94 horsepower. 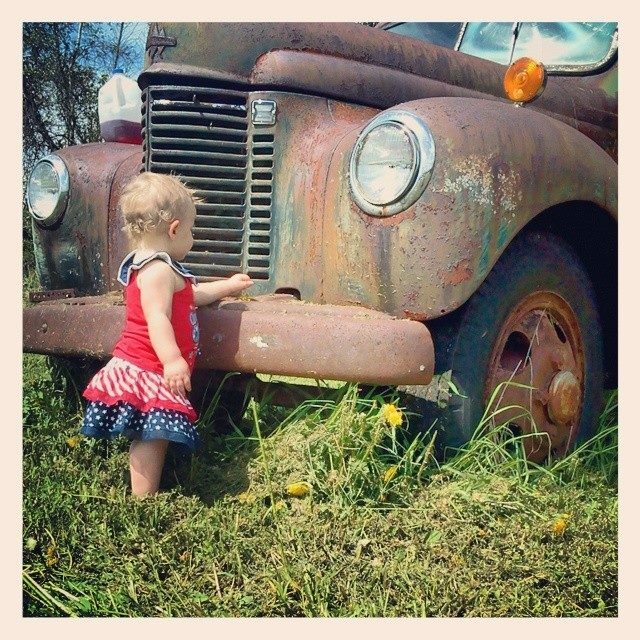 Our vintage cars are cherished. Yet, they were and are race cars and we choose to race that vintage tin once more ! We all clearly understand that by the very fact that we are really racing these antique cars, ‘racing incidents’ will and do occur, and that we will bend our antique race machinery on occasion. Yet, over our nearly 15 year history of operation, not one of our “elderly” race cars has been seriously damaged or destroyed, although we have certainly had our exciting moments. Our race cars are repairable; the drivers perhaps less so. Our race drivers, fully aware that it is always one of our friends driving the other car, choose to refrain from the intentional and sometimes dangerous slam bang aggressiveness that takes place at many of today’s modern racing facilities. Our drivers may race hard, but one sees no ungentlemanly behavior from our vintage race car drivers. What one can expect to see is a crowd of competitors surrounding someone else’s damaged race car, working together to repair it as quickly as possible. The one exception we make to originality is where safety is concerned. Roll cages are either of modern design and materials or significantly upgraded originals, renewed to modern standards. Safety harnesses, seats, and helmets are also modern and much different from those fashionable 50 years ago. We all wish to go home at the conclusion of our race day. The laughter, the smiles, and the amicable “bantering” one hears coming from our pit area demonstrates that same joviality and fellowship as was experienced during the 1950’s. This alone is a welcome relief for a number of our drivers who have “escaped” from today’s intense racing environment. 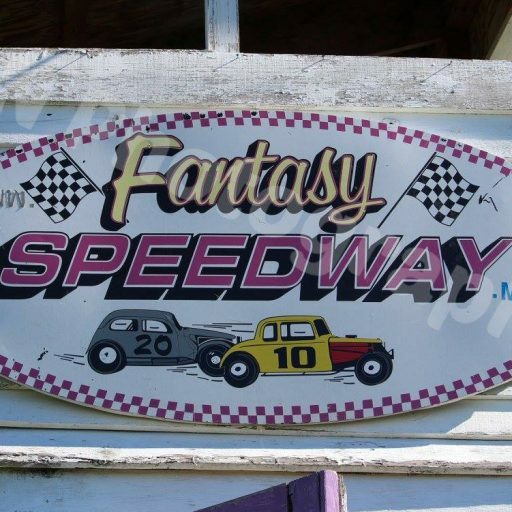 Whether it is donating engines or other critical parts to our friends; working as part of a team to repair a competitor’s car for the feature; encouraging, assisting, and becoming a part of another’s success, cheering for your chief competitor, or swapping drivers or cars for the next race; sportsmanship is the name of the game here at Fantasy Speedway. Having this much fun with our olde race cars, as well as enjoying the friendship of those who build and race them with us, was for many years considered to be quite impossible at best. Yet here we are today, a mere 6+ decades later, undertaking this adventure together; and sharing our fun. It is a remarkably good day !